Fact is, we haven't had enough YA historical fiction on this blog. Diana Reep is here to fix that, sharing some background about her novel, The Dangerous Summer of Jesse Turner. Hold onto your hats: we're in for some rough riding. I appreciate the chance to talk about my teen historical adventure, The Dangerous Summer of Jesse Turner. I prefer to write fiction based on action-packed exploits in the past. The Spanish-American War of 1898, although brief, certainly fit that requirement and also was crucial in creating an independent Cuba. My research partner and I were discussing the 1890s in general when we realized the war was a perfect setting for a teen adventure. President McKinley sent the regular U.S. Army to Cuba, but the First U.S. Volunteer Cavalry Regiment formed by Lt. Col. Theodore Roosevelt captured the attention of the public. Volunteers for the Rough Riders, as the regiment was called, came from across the nation—cowboys, students from Yale and Harvard, farmers, and Indians from the western territories. The challenge in historical fiction is to create vivid characters who live their own lives within the framework of historical events. The diversity of Rough Rider volunteers made it easy to develop three teens from different backgrounds who find friendship and loyal comrades amid sudden bloody conflict. Choosing the teen to narrate the story was also easy. Jesse Turner is from a small town in the Missouri area where the famous outlaws Frank and Jesse James and the Younger brothers once lived. Attaching his family background to the outlaw history means he has to face a personal enemy among his fellow Rough Riders along with the deadly hazards of combat. His pals, New Yorker Will and Ben, a Comanche from the territories, share his dangers and struggle with their own personal tests. The fun in research for me is finding stories that lie beneath the general surface record. For instance, although the volunteers were called Rough Riders, they had to leave most of their horses behind in Florida because the decrepit merchant ships taking them to Cuba were overloaded with troops. Of the horses that did sail to Cuba, most drowned in attempting to land on the beaches. So, the Rough Riders walked through the jungle and fought on foot. Battles often get the most attention in history books, but just as important were the daily frustrations the volunteers had to face—ugly land crabs, heat, rotten food, fever, torrential rains, and constant wet feet. Readers who like fast-paced action-adventure will find it in The Dangerous Summer of Jesse Turner. As a writer I hated to leave Jesse, Will, and Ben, and they remain my favorite characters. 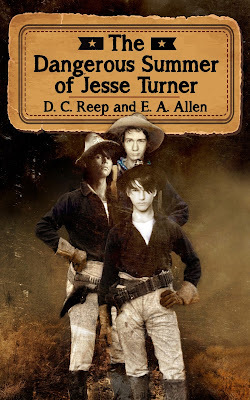 Blurb: When sixteen-year-old Jesse Turner lies about his age and joins Colonel Theodore Roosevelt’s Rough Riders, he expects to prove himself in battle. What he doesn’t expect is a fellow volunteer determined to kill him for something his outlaw father did in the past. Jesse and his new friends, New Yorker Will and Ben, a Comanche from the Indian Territories, share the hazards of a volunteer military force unprepared for war and the reality of deadly combat. Facing dangers from all sides, the three teens depend on friendship, courage, and integrity to get them through the bloody action of the Spanish-American War. Learn more about Diana Reep here. Over on Eat Sleep Write, I've now got two columns under my belt. Pop on over if you're interested. I'm having a fun time so far, and learning a lot as I go. Let me know what you think, and also if there are certain topics you'd like me to cover.